SVG embedded inside HTML, appears to simply extend the grammar of HTML, and perfectly co-exists in the DOM. Angular can latch on to that and work with it. 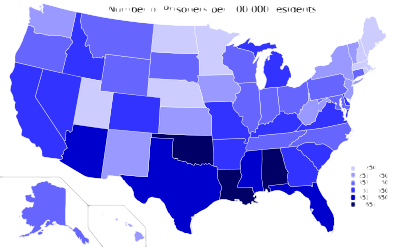 I tool a SVG map of the states of the USA from Wikipedia and embedded it in a HTML page. I added Angular and bound incarceration data from another wikipedia page and made that a JSON model for Angular to consume. Click here to see the result as stand alone. Yes you can interact with it. 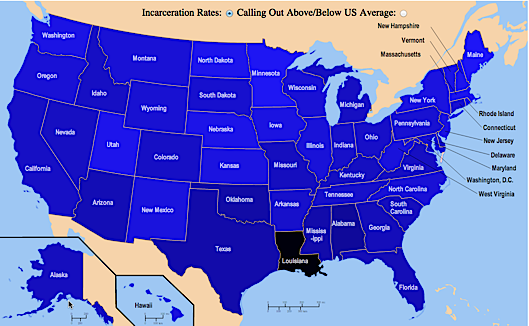 One view shows a blue with increasing darkness for incarceration rates. 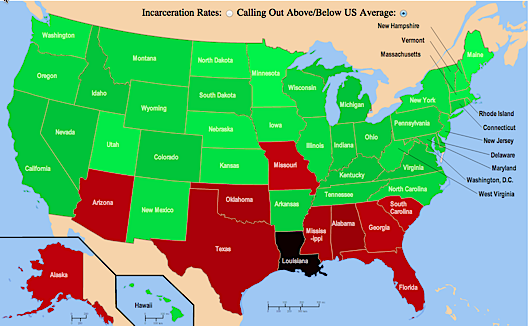 The other one has green to show below US average incarceration rates, and red to show above average rates. I’m not a statistician though, and the luminosity calculations could be off.